In World War I, there was a popular refrain in France and the West generally expressing sympathetic support for their gallant Serbian allies, who were standing up to combined enemy armies on the Salonica front: Pauvres Serbes…That refrain still very much resonates but is no longer exclusively confined to the moral sphere, as it largely was a hundred years ago. Today, it epitomizes the dismal overall condition of the broken Serbian nation (on that subject, more in a later dispatch). For accuracy and clarification it should undoubtedly be amended, or expanded if you will, to read Pauvre Serbie, as well. Following three serious bloodlettings in the course of a century (World War I, with up to a third of the population missing on Armistice day in 1918, World War II, with three quarters of a million slaughtered in the genocide committed by the Nazi satellite Croatia in 1941 – 1945, and a minimum of 100,000 of the best, brightest, and most able Serbs executed and exiled on ideological grounds by the Tito regime after it was installed in 1945) present-day Serbia is the ravaged land of an exhausted, dispirited, and dispossessed people. Its ambitions are low and its defenses are down. Serbia today is ruled by a Uganda-style madman and his coterie of venal incompetents. This sorry bunch is manifestly unfit to govern any country (African or European, or even just Balkan for that matter). 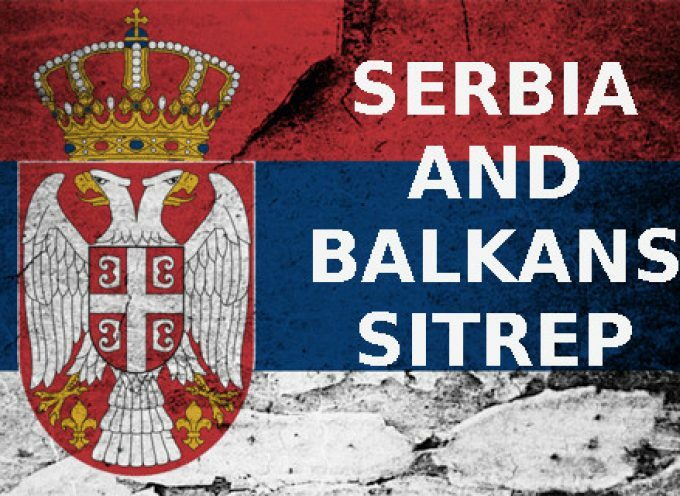 Serbia’s current regime was conceived, by all accounts, as a clever stratagem of Western intelligence services in the early years of this century. It was an attempt to politically profit from the leadership vacuum in the rabidly nationalist Radical Party, whose leader had been safely locked away at the Hague, battling trumped-up (no pun intended) war crimes charges. His two main deputies in Belgrade were correctly diagnosed as ripe for recruitment. The “main prize” (to borrow a famous meme from the Ukrainian crisis) in that particular game of thrones was formal recognition by Serbia of the NATO-sponsored “independence” of Serbia’s resource-laden province of Kosovo, with some subsequent collateral benefits such as Serbia’s humiliating incorporation into NATO, for instance. One of the two turncoats was even lionized as Serbia’s potential De Gaulle, perhaps with the prospect of a drastically devalued Nobel Peace prize dangled before him, and just for the trifle of signing off on the Kosovo land grab, unilaterally declared under Western auspices in 2008. The false analogy was missed by all the interested parties. For whatever reasons that concern the French alone, De Gaulle did stop the colonial war in Algeria, giving up a territory that had no link whatsoever to historical France and coming under French rule relatively recently in 1830 when in a fit of anger its tactless bey slapped a French diplomat. Kosovo, on the other hand, is the historical and cultural heartland of the Serbian nation and its Orthodox church. There is no comparison. Renouncing Kosovo would not be the meritorious act of a Serbian De Gaulle, but conjures up more precisely the treachery of Mexican president Santa Ana, when he signed the treaty of Guadalupe Hidalgo. A small but by no means insignificant detail that was inexplicably missed by all the geniuses involved. ENTREFILET: Serbian “opposition leaders” were caught on Candid Camera in early February taking orders from US Embassy officials at the Belgrade Hilton. That strongly suggests that weekly Saturday street protests in Belgrade and towns across Serbia are foreign embassy coordinated and that “opposition” leaders are lying when they claim to be advocating for the interests of citizens. They are acting on behalf of their foreign bosses and paymasters and their task is to produce internal destabilization designed to serve foreign interests. There is not the slightest doubt, however, that the Kosovo noose is rapidly tightening. Matthew Palmer, State Department official in charge of disciplining Balkan chieftains, has just made it crystal clear on March 8 that the signing of a comprehensive treaty of mutual recognition with the NATO-run narco outfit of Kosovo “is the essence” of what Serbia is expected to do, and that was not a mistranslation. There is not much wiggle room left for Serbia’s Santa Ana. To drive the point home, Serbia’s Guaidos-in-waiting are staging weekly demonstrations (peaceful for the moment) to demand a variety of abstract-sounding democratic concessions from the regime. Significantly, demonstration organizers make no mention of the Kosovo issue, which is uppermost in the hearts and minds of most Serbs. Not to be overlooked, Belgrade just happens to be the location of the headquarters of Otpor, the Western-intelligence funded outfit famous for its leading role in organizing protests which toppled Slobodan Milosevic. Otpor is now renamed Canvas. Canvas is renting out its experience and services to their paymasters around the world, wherever a “color revolution” is deemed needed. By a huge coincidence, no doubt, Canvas was recently detected as having trained Juan Guaido personally in Belgrade as far back as 2005 and boasts of its role in Venezuela on its internet site. Add to that London Freedom House’s ominous “assessments” of the Serbian situation (e.g. “Serbia’s status declined from Free to Partly Free due to deterioration in the conduct of elections, continued attempts by the government and allied media outlets to undermine the independent journalists through legal harassment and smear campaigns, and […] de facto accumulation of executive powers that conflict with constitutional role”), and all the elements are in place for insomnia at the presidential palace. Not to be outdone, just days ago, after visiting the imperial metropolis for “consultations,” one of the potential Serbian Guaidos, former foreign minister Vuk Jeremic, accused the regime of having already secretly committed itself to capitulate on Kosovo within weeks, hinting that this information was disclosed to him at the highest levels (never mind that Jeremic’s hypothetical regime would continue where the present regime left off). Another Guaido hopeful, Dragan Djilas, was off to Skopje to pay respects to NATO-installed local puppet and presumably his future model Zoran Zaev, gushing excitedly that being received by a statesman of such caliber was an unforgettable “honor.” With Freedom House greasing the skids for “partly fee” Serbia’s enlistment in the next axis or troika of evil, Canvas close at hand to pull off the street job, eager candidates ready to declare themselves “interim president” on Belgrade’s main square, and rumors of a “Balkan spring” in the air, for the beleaguered Belgrade officials a quick Google search for countries without an extradition treaty with Serbia would not be an entirely foolish waste of time.